The readers have sent in a few comments and questions over the past couple days, I've selected a few to respond to . .
A few. I'd love to tell you that the most star crossed Cowboys fan can look at this and say something in the neighborhood of, "at least they fought back being down 17," but that isn't good enough. These are the types of games Jason Garrett needs to win to prove he's something more than a mouthpiece. Proving that costly errors aren't as frequent, proving that failing to drop the hammer is a thing of the past, but he and the Cowboys just didn't do that. 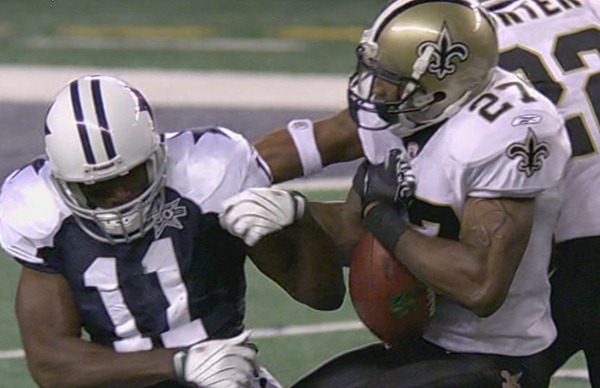 Roy Williams was stripped of the ball inside the ten with the game on the line, and the Saints sprinted down the field scoring quicker than you can blink. Ball game over. Cowboys drop to 3-8. I've always thought Auburn was 1A, and I still do. Let me say something about 'Bama though, they're soft. The defending National Champions finished their regular season at 9-3 with three SEC losses. South Carolina, LSU, and Auburn all proved they were more mentally tough than Alabama. Up 24-points against Auburn at your own place and you can't put them away?!? As Auburn and South Carolina set to square off for the SEC Championship, it's only fitting that both teams had to go through the defending champs to do so. Not just Arizona, and yes they did experience that on Friday night. Arizona, among others, watched Oregon explode in the second half and outscore them to the tune of 34-10 over the last two quarters. Both USC and Stanford watched Oregon do the same thing to them earlier this season. 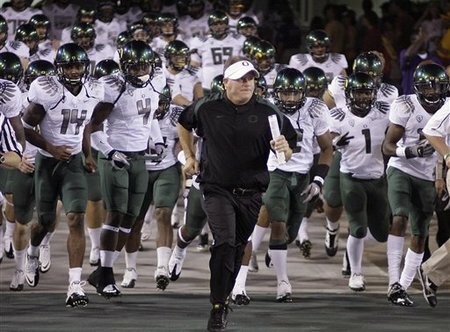 The one constant in Eugene is speed, from the coach and quarterback to their entire offensive line, they're moving. They play possum in the first half and find out where they can attack after halftime, then they go for the throat. Head coach Chip Kelly was interviewed just as his team was headed into the locker room down 19-13, he told the sideline reporter he was more than confident and not worried at all about the Ducks 6-point halftime deficit. Of course he was confident, just a little over a minute into the second half in just two plays, Oregon went 85-yards and took a 20-19 lead and never looked back. Oregon is scary good, flat out. It all works out. As much as you want to say that the BCS is broken, it's again going to give us the best team in the country as the National Champion (well, TCU might not be happy about it), but everyone else will be. As bad as I felt for the Boise State kicker missing two chip-shot field goals in the final minutes as his teams National Championship hopes slid away, Boise State had no room for error and they knew that. Just as Auburn & Oregon have to win every week, so does Boise and TCU, and now there are three. Just know that Boise is a very good program and losing to Nevada doesn't change that. The Red Sox are prepared to let Adrian Beltre walk. He's going to get paid this offseason and the Red Sox aren't going to be the ones who pay him, leaving an open position at 3rd base. Jeter's range has definately slipped in recent years, it's obvious at 36-years old (maybe a few years early) he should make the move over to the hot corner. Look, some players are worth the extra money. Derek Jeter is the most veteran postseason player you can find. If the Red Sox are prepared to move to the youth in their organization, wouldn't Derek Jeter be the ideal player to mentor them? I'm a fan at heart and I'd love to see the Red Sox throw around some money at a guy like Jeter. He'd instantly be a hit in this market and he'd up the anty in this rivalry for sure. The thing Red Sox fans hate most about Derek Jeter, is there isn't much to hate about him. He isn't a blantant a**hole like Rodriguez. He's 'The Captain,' just stop and think about it for ten minutes. Derek Jeter in a Red Sox uniform?!? If you're looking to send in questions, feel free to send them in to leave comments or follow me on Twitter!